Once Twitter is public, it will be under pressure to make even more money from its 200 million users. 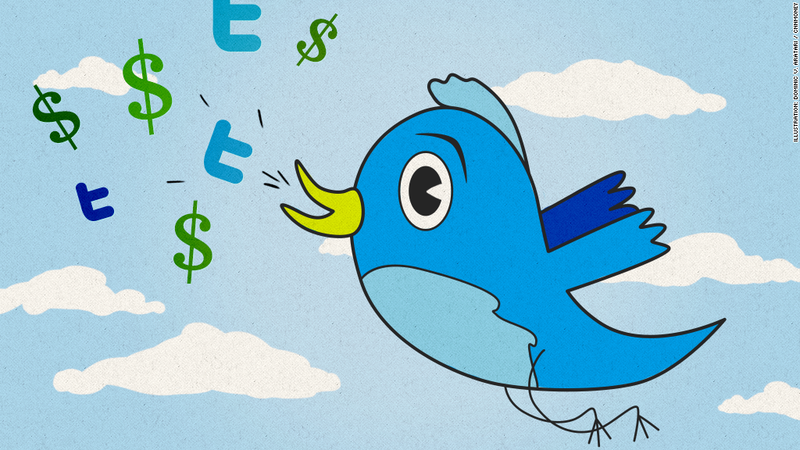 Hey, little Twitter bird: It's time for you to show the stock market that you can make money. Facebook (FB) and LinkedIn (LNKD) have proven that social media is a viable business. But Twitter's simplistic "micro-blogging" format carries bigger question marks than its peers. Twitter's ads are rather unobtrusive by Internet standards, and it's unclear how successful the company's strategy has been. Because Twitter filed for an initial public offering confidentially, the world won't know for some time. Research firm eMarketer estimates that Twitter's ad revenue will more than double this year to nearly $583 million. But it's a safe bet that no matter how successful Twitter's ad business has been so far, advertising on the social network will expand when the company goes public and investors begin demanding growth. The current model: Like many of the newly public Internet companies, namely Facebook, Twitter's business model is dominated by ads. Rather than splash its homepage with display ads, Twitter includes sponsored content tucked right into users' feeds. The ads are denoted with the word "promoted" next to a yellow-orange arrow. Twitter runs ads for corporate accounts, as well as specific tweets and topics. Search for AT&T (T) on Twitter, and a "promoted tweet" from Verizon (VZ) or Microsoft's (MSFT) Windows Phone may pop up. A "who to follow" box suggests a promoted corporate account like Macy's (M) in the top slot. Advertisers can also place "trends" -- say, the name of a TV show premiering tonight -- in the list of topics that are popular worldwide or in a particular locale. Mobile strength: The big upshot for Twitter sales: More than half of this year's revenue is expected to come from mobile ads, according to eMarketer. As the PC continues to decline, the focus on making money from mobile users can't be overstated -- and Facebook's disastrous IPO put that fact into sharp focus. Facebook didn't launch mobile ads until after its IPO, and the stock suffered until that point. Advertisers can launch campaigns shown only to mobile users, or even target Google (GOOG) Android or Apple (AAPL) iOS devices specifically. Future ad expansion: Twitter's recent flurry of acquisitions show the company is squarely focused on beefing up its attractiveness to advertisers. Just this week, Twitter bought mobile-focused ad exchange MoPub for a reported $300 million. More specifically, Twitter appears to be fine-tuning its focus on TV. Earlier this year, Twitter bought Bluefin Labs and Trendrr, both of which specialize in tracking the chatter around TV programming. Twitter declined to comment on its future ad plans, citing the "quiet period" required after an IPO filing. But it's easy to see how advertisers would gladly pay for data that gives them insight into consumer opinion around specific topics like TV shows or a new snack food. And, of course, advertisers would love to target those particular users with more and more "sponsored" content. Like its predecessors, Twitter will have to toe the line between creating a viable business and alienating users with a barrage of ads. Even Yahoo (YHOO) had to promise in its press release announcing the purchase of mostly ad-free blogging site Tumblr that the company wouldn't "screw it up." As a newly public company, Twitter will have to be even more careful of those potential screw-ups.